With the Grundfos ALPHA, you can stop worrying about complicated pump settings. Simply install the pump and leave it on the factory setting AUTOADAPT. The ALPHA will automatically analyze the heating system, find the optimum setting and continue to adjust its operation to changes in demand. With its permanent magnet motor design, this energy efficient circulator will reduce power consumption up to 80 %. Ensuring lowest possible energy consumption without sacrificing comfort. The Grundfos ALPHA is designed for circulating liquids in light commercial and residential heating systems. Available in cast-iron pump housings for closed systems or stainless steel housings for open or domestic hot-water systems. 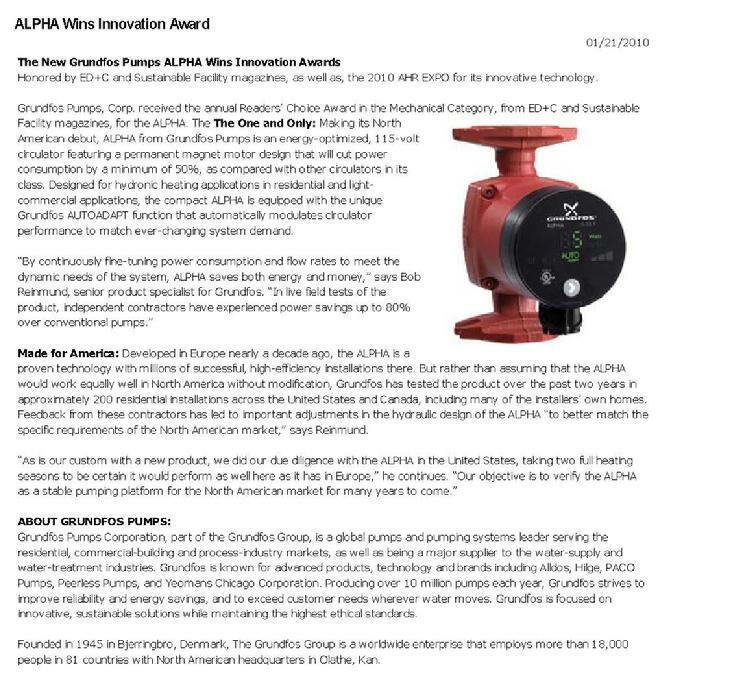 Intended for residential and light commercial hydronic applications, ALPHA� features the innovative AUTOADAPT� function that automatically and continuously adjusts circulator performance to the changing needs of the hydronic heating system. First used by Grundfos in <?xml:namespace prefix = st1 ns = "urn:schemas-microsoft-com:office:smarttags" />Europe earlier this decade, the electronically controlled motor features a magnetized rotor, thus avoiding motor-slippage problems common to induction-type motors. The result is a dramatically more efficient motor that generates less heat and energy waste, while delivering a starting torque four times higher than a standard induction motor � a key feature should the pump experience long periods of idleness. 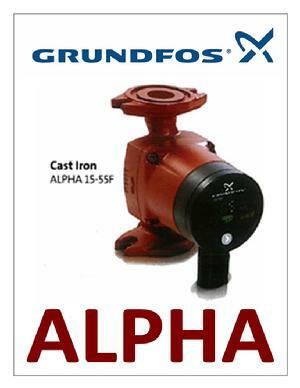 ALPHA is currently the most compact circulator offered by Grundfos. Rather than being attached to the circulator�s body, its sophisticated electronics are fully integrated within the motor. The resulting streamlined design simplifies installation in even the tightest of spaces. � A large, real-time display indicates energy consumption (Watts). � This same display will toggle every four seconds between power consumption and the flow indicator, showing the relative estimated flow rate in gallons per minute (GPM). � A one-touch, button-type interface permits the user to toggle quickly and easily among seven different hydraulic operating modes: three fixed speeds, three levels of constant pressure, and the AUTOADAPT setting. ALPHA offers a flow range of 0 to 21 GPM and a head range from 0 to 19 feet. It can handle fluid temperatures from 36�F to 230�F with a maximum working pressure of 150 pounds per square inch (psi). � Plug-and-play convenience: The unique ALPHA Plug eliminates the need to open and wire a terminal box to create an electrical connection. A six-foot-long power cord connects the circulator to a wall outlet, with no wiring required. � Installer-friendly pipe connections: The circulator�s volute has a standard two-bolt flange with a built-in nut-capture feature that holds the bolt steady during tightening. Spared from having to use a second wrench to keep the bolt from slipping or turning, the installer has a free hand to hold the circulator in place. � Backflow prevention: An optional check valve can be integrated into the circulator to prevent backflow from occurring. � Two different material options: In addition to the cast-iron and cast-iron-rotated models, the ALPHA is available with a stainless steel volute for more challenging, aggressive-water environments. Grundfos Pumps Corporation, part of the Grundfos Group, is a global pumps and pumping systems leader serving the residential, commercial building and process industry markets, as well as being a major supplier to the water supply and water treatment industries. Grundfos is known for advanced products, technology, and brands including, Alldos, Hilge, PACO Pumps, Peerless Pumps, and Yeomans Chicago Corp. Producing over 10 million pumps each year, Grundfos strives to improve reliability and energy savings, and to exceed customer needs wherever water moves. Grundfos is focused on innovative, sustainable solutions while maintaining the highest ethical standards. Founded in 1945 in Bjerringbro, Denmark, The Grundfos Group is a worldwide enterprise that employs more than 18,000 people in 81 countries with North American headquarters in Olathe, Kansas.